Proven quality for up to 5 two step drives. Available with numerous valuable features. Up to 10 two-step push buttons. Up to 1 rotary switches/buttons. Ca. 30 hours of continuous operating time. 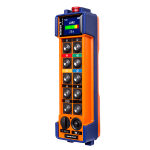 Options: radiomatic® AFS, catch-release, tandem operation, radiomatic® infrakey, safety features radiomatic® shock-off / roll-detect / zero-g. Recommended receivers: FSE 510, FSE 512, FSE 516, FSE 524, FSE 726 / 736 radiobus®.